I feel as though I can actually take a deep breath, and it gets the oxygen to where it’s meant to go. The ‘library’ that I write in at home has been bugging the crap out of me for a really long time, and I just had absolutely no idea why. But then I figured it out. My back was to the door when I was working, and every time someone came in while I was writing, they would scare the bejeezus out of me. So, as mentioned in a previous post, this weekend I decided to pull my library apart to refigure it all out, so that my back wouldn’t be to the door anymore. This way, I’ll have a focused workspace, and will stop aging 10 years each time someone walks into the room. My husband at least had the decency to warn me that he was standing there by playing with the light dimmer, as he knows that when I’m writing – I’m totally immersed. But everyone else would just walk in and I would jump and panic, and practically have heart failure. The next thing I am trying to do at this stage is climb out of my writing world and back into reality. And do you know how long it actually takes to get back into that writing groove? Well, depending on how pissed off I am at the person for interrupting me – it can take a while. Reference books all lined up! And now it’s complete. WOOHOO! Yes, I am dancing. I am just feeling so amazingly better about this space, than I have in a very long time. 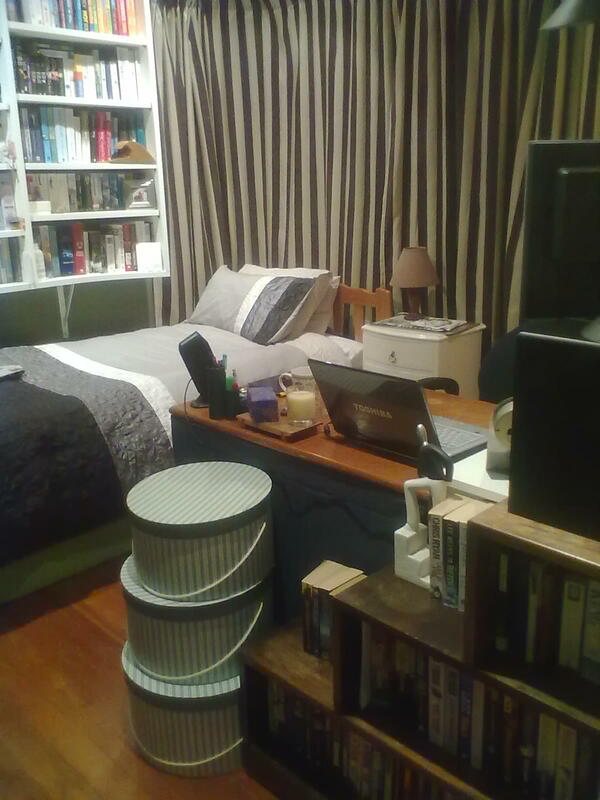 I know that I have put the bed kind of under the bookshelf – but it is bracketed, and ifthere is an earthquake and all the books fall off – well – I don’t think that’s such a bad way to die in the great scheme of things. Okay, I know, I know – death by books… time for my injection. I’m a little twisted. But seriously. How gorgeous is this? It makes me feel wonderful. A great space to create new and wonderful worlds. I’m very lucky that my wonderful husband had the foresight to buy me the most amazing sound system, which is now completely hooked up, and mostly hidden from plain sight. Also – you will note from the photos that there are no wires anywhere! I know. Pretty much got rid of the acres of wiring that would get tangled up around my feet and annoyed me. Now they are hidden away nicely. So, here’s to a new writing space makeover. 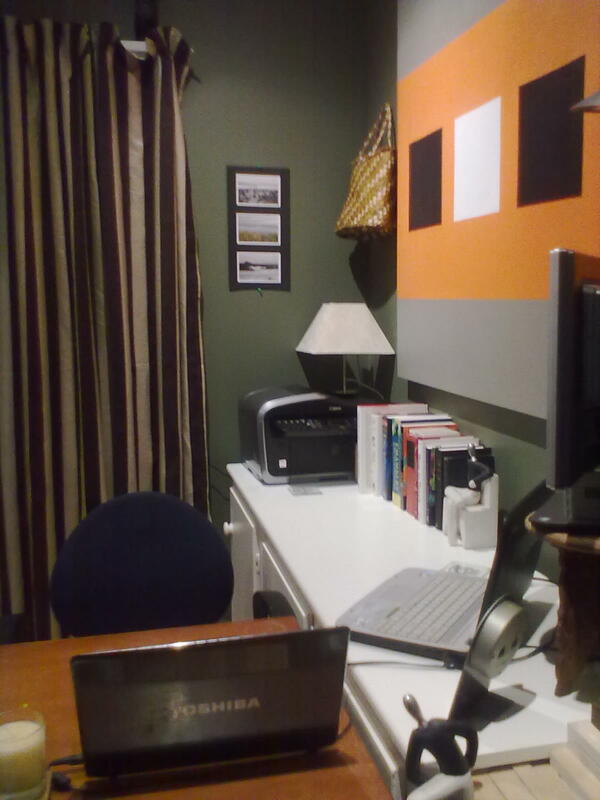 I absolutely love to see other peoples writing spaces, so direct me to photos of your space if you have them online. Heart-attack prevention: Desk now facing the door! That looks really great! I know how much work that is. You must be exhausted! Love the new writing space! Yes, much better to face the door and not have heart attacks when someone walks in. I have a question though? 3 computers? Lol – that is something I’ll have to explain to you later! It feels much, much better than before 🙂 I do actually feel like I can achieve a lot more in there now. Before I think I was all boggled up, and you can see why I was definitely not happy! omigod u had me in stitches- now I can re-imagine how you felt when those non-existant ghosts were tramping around in your house in the middle of the night! 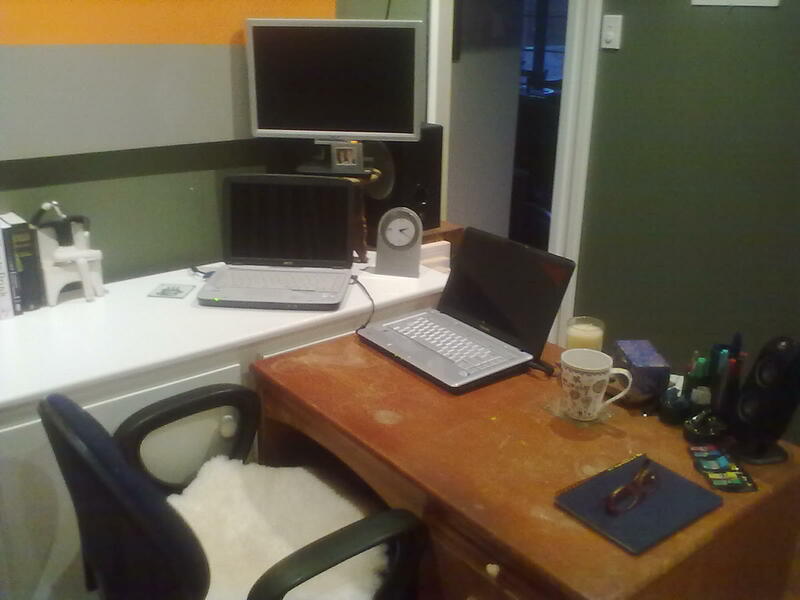 Writing space looks awsome and er… ditto on Kim’s 3 computers? O and I am a bit concerned for Kim now- esp if she’s going to risk life and limb sleeping in that gorgeous bed… To survive a tornado and die by books… good epitaph? Wow, that looks amazing – jealous! 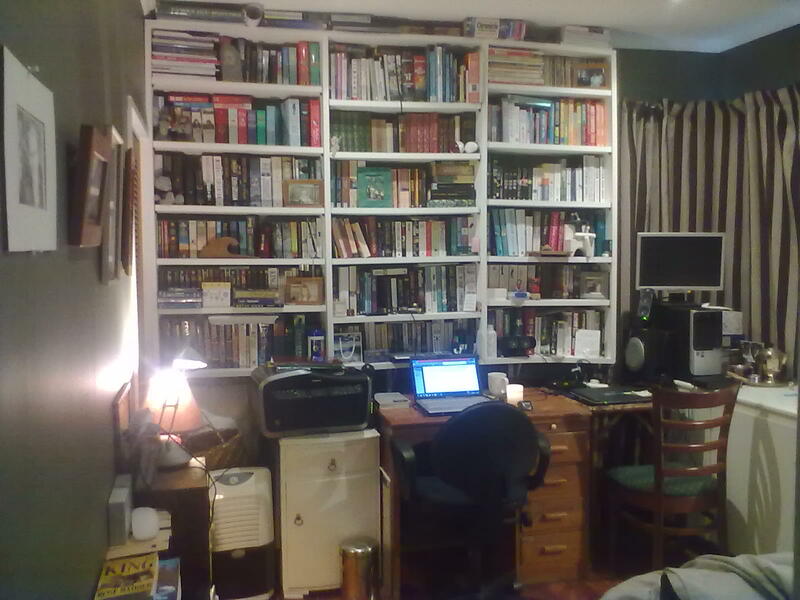 Am going to repaint my study once the weather gets better. New carpet too, hopefully! Photos then.